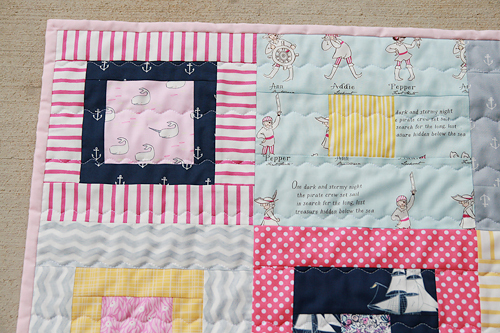 Over the last couple of months I've had the chance to make two baby quilts for little girls. 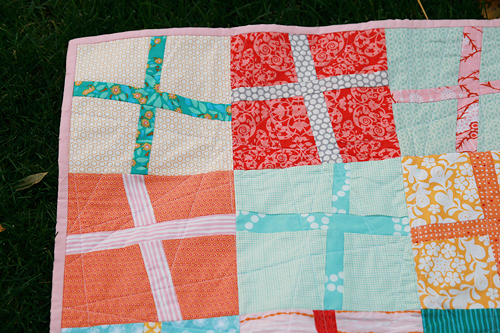 I love smaller quilts, they make me feel like I accomplished something in a shorter period of time. They also allow me to dive into new fabric piles right away. I'm not going to win any photography awards for these pictures but I wanted to share them with you anyway. It happened to be rainy and gloomy when I finished both - and they needed to be wrapped and gifted right away. 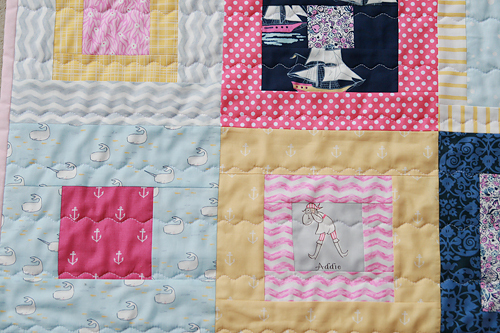 I made this first quilt mostly with fabric from Sarah Jane Studio's line, Out to Sea. I did incorporate some others from my stash....some pink and white dots from Children at Play, a navy print from Sandi Henderson's Secret Garden, a yellow stripe from Cloud 9's Simpatico, a yellow cross hatch as well. I used another squares-in-squares design, I hope you aren't tired of those yet! 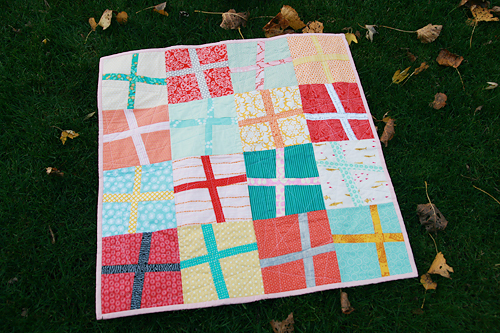 Actually, these blocks came from my Lemon Squares quilt pattern (free!). I just didn't use any white on this smaller quilt. 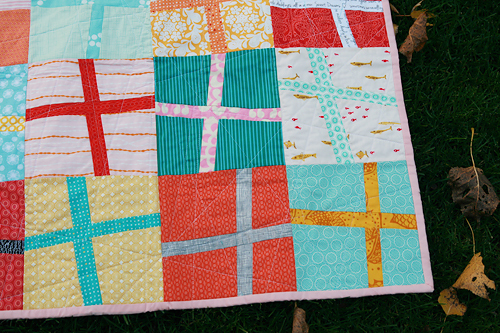 I backed the quilt with minky to make it super soft and quilted it with wavy lines. I think it will be perfect for fall and winter in Chicago. 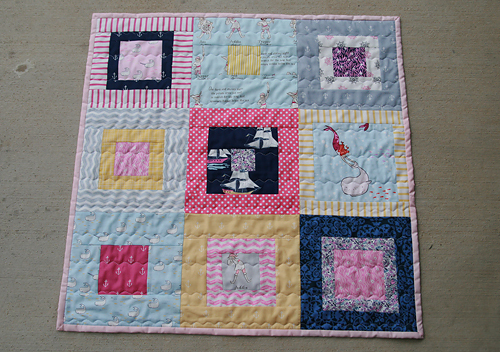 This next quilt is for a little girl I met in SLC at the Sewing Summit. I pulled an assortment of fabrics from my stash for this one. 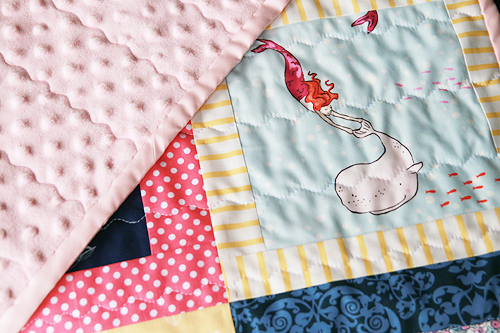 I wanted the quilt to be feminine without screaming "I'm a girl!!" Hopefully that came across in my color selections. I chose a modern, wonky cross design. Somehow I've never made a wonky cross quilt before, only blocks. I had a lot of fun with this one. The quilting is random straight lines. I wanted it to stay nice and soft after lots of washing. 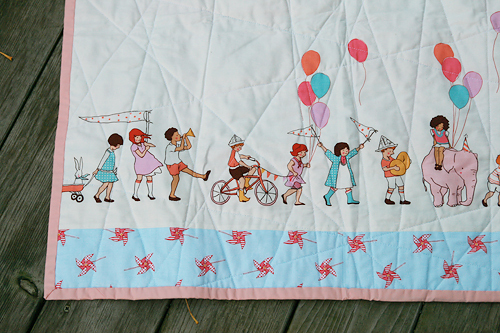 The backing is the parade panel from Sarah Jane Studio's Children at Play with some pinwheels along the bottom. Hopefully both quilts are well loved over the next several years!